Volunteers are highly valued members of the Greenwood team. 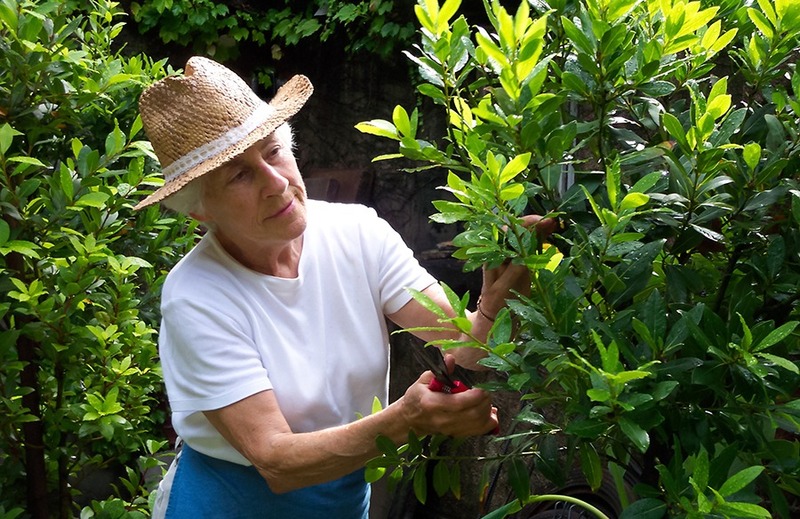 We depend on volunteers to help us carry out our mission by assisting in the gardens, leading tours as docents, helping with administrative duties, conducting research, and much more. 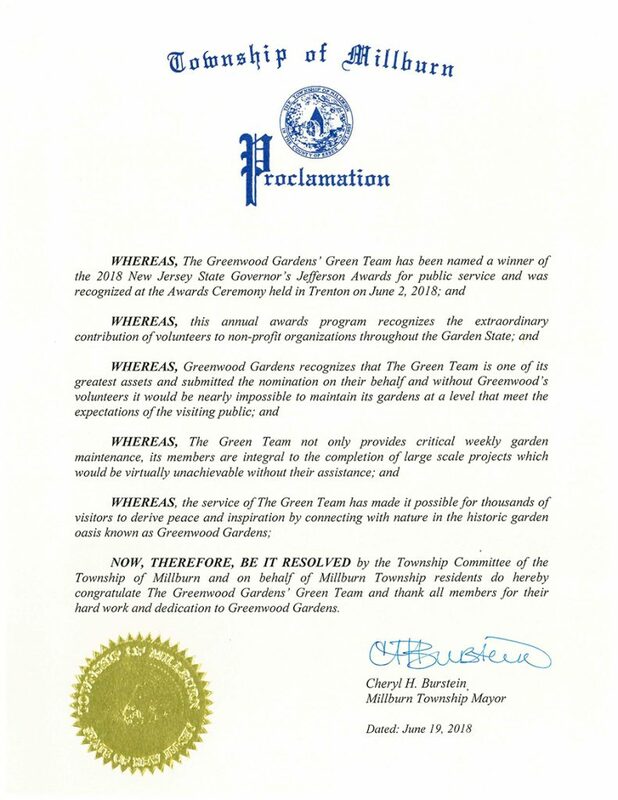 In recognition of their dedication and invaluable contributions, the Greenwood Gardens’ Green Team received the 2018 New Jersey State Governor’s Jefferson Award for Public Service. If you are interested in being part of an energetic and knowledgeable team, contact us so together, we can endeavor to put your special skills and talents to work for our mutual benefit! Call 973-258-4026 or write to info@greenwoodgardens.org. 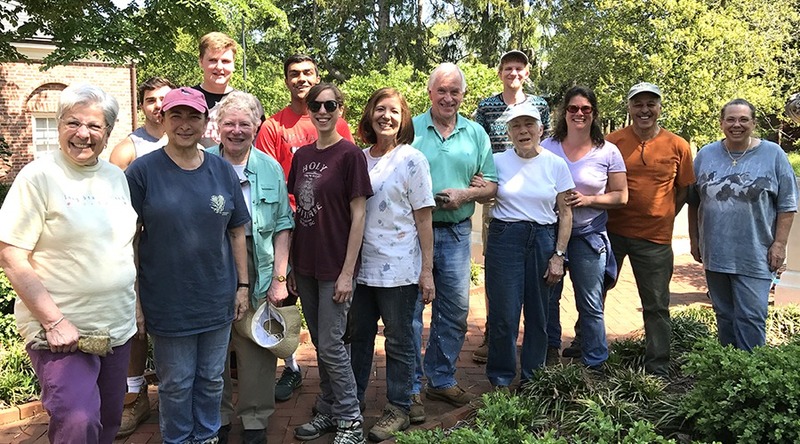 Joining the Greenwood Gardens’ Green Team is a great way to connect with nature in a beautiful historic garden. Learn from our expert horticulture staff who will offer clear instructions and guidance along the way. Work activities include general garden maintenance, planting container displays and occasional greenhouse work. The volunteers assist staff with planting, watering, weeding, pruning, mulching and working on special projects. We encourage you to join our monthly plant walks to learn about our garden and view the impact of your contributions! Trained Volunteer Docents help educate the public and enhance the experience of all who visit Greenwood. Tours are held seven days a week, May through November, and focus on Greenwood’s history, horticulture features, conservation, and stewardship efforts. Qualified applicants attend a day of training and work with a mentor until they feel comfortable leading tours on their own. Greenwood Gardens is very proud to announce that our Green Team volunteers were awarded the PSEG Environmental Stewardship award during the 2018 New Jersey State Governor’s Jefferson Awards presentation ceremony held at the War Memorial in Trenton, NJ on Saturday, June 2. 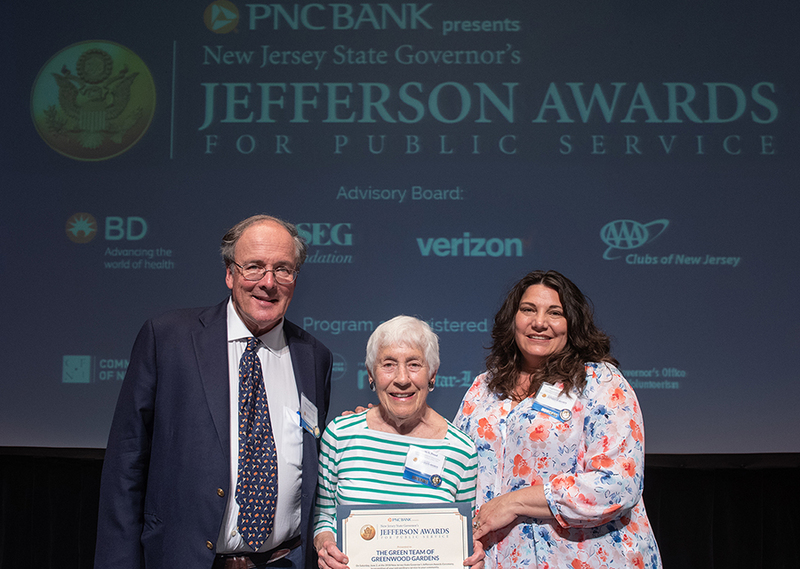 Each year the New Jersey State Governor’s Jefferson Awards highlight the spirit of civic engagement among New Jersey’s 1.5 million volunteers and presents Jefferson Awards medals in 22 categories of volunteer service. Considered America’s highest honor for public service and volunteerism, the Jefferson Awards were established in 1972 as the official recognition program of the United States Senate. In New Jersey, the awards are also the official recognition program of the Governor’s Advisory Council on Volunteerism, administered by a partnership that includes the NJ Office of Volunteerism, NJ Advance Media, the Community Foundation of New Jersey, and corporate sponsors, such as PNC Bank, PSEG, BD and others. The Greenwood Gardens staff, Board and Advisory Board of Greenwood, extend their deepest appreciation for the Green Team’s many years of dedicated service and recognizes the unflagging efforts of founding member, Lezette G. Proud; Greenwood Founder Peter P. Blanchard III; Manager of Programs and Public Engagement Stephanie Murphy; Head of Horticulture Sonia Uyterhoeven; and Gardener Joan Mutascio, in making the promise of The Green Team a reality. Accepting the New Jersey State Governor’s Jefferson award on behalf of the Green Team are, from left: Peter P. Blanchard III; Lezette G. Proud; and Stephanie Murphy.